It’s been too long since I’ve last written–horrible inconsistency. But even in the craziness of my days, I’ve been tucking away moments, so anxious to share my little scraps of holy with you. I blog for many reasons, but as of late when I think of blogging, I’m reminded of the childhood correspondence I kept with my granny. For years—even into high school—we wrote letters to one another the old fashioned way; using a pen, stationary, envelope, and stamp. I loved buying beautiful stationary. I would walk into my local Hallmark store and spend extra time looking at all the pretty paper, trying to decide which one my granny would love best. My favorites were always those with watery floral designs painted along the top and bottom and small flecks of color embedded throughout each creamy, home-made, looking page. These were the most expensive and never lined. So I always opted for the bigger, cheaper box of stationary with the least offensive, blooming rose printed along the right-hand side and enough lines per page so that my letters wouldn’t cost more than one stamp to mail. When I write on my blog, sharing with you the little moments in my day, I often feel the same way I did when writing her. She—like you—could see and appreciate the holy in my moments, even though I was just telling her stories, or wondering about things I couldn’t understand, or whining over my personal life dramas. And occasionally, by God’s grace and writing down into the fibers, I could see the holy, too. And there is so much holy mundaneness I’ve been wanting to share with you! Berry’s questions make me chuckle as I look out to the backyard forest I thought would never bloom. It was so grey and dry and angular. 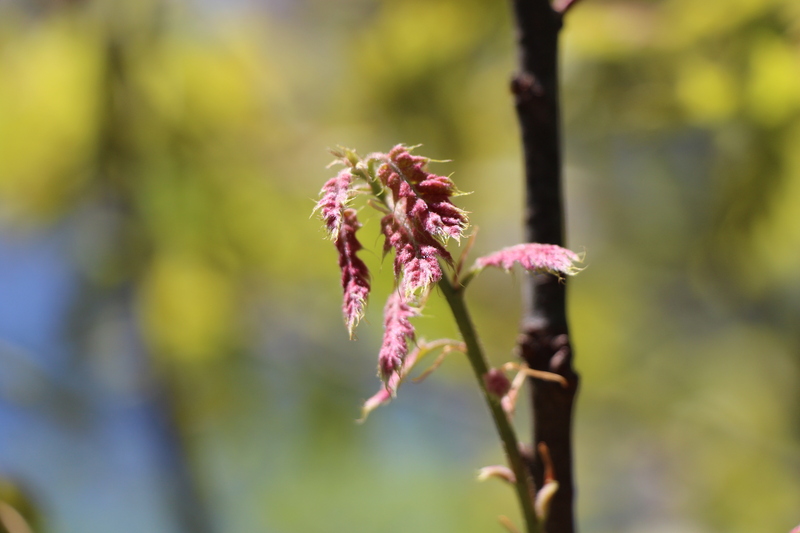 Then one day a week or so ago, I saw the tiniest baby oak leaves budding. It reminded me of a picture floating around facebook, the one of the baby in gestation reaching out with her perfectly formed, dime-sized fist to grab a doctor’s finger as he or she performs some delicate surgery that requires opening the mother’s womb. Have you seen that one? 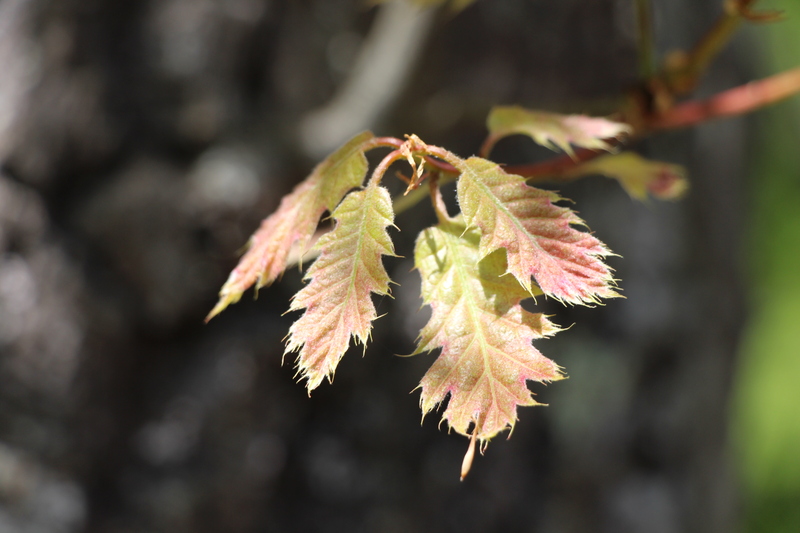 Here in my backyard were these tiny baby oak leaves—all their veins and lobes perfectly formed. Clearly these were oak leaves, but I couldn’t imagine how they would ever reach maturity in time for summer. And then within three days, those baby oak leaves were fully grown, ready to provide—among other wonders—shade for the birds, the chipmunks, and my afternoon writing. Second, there was the unexpected visit of a dear friend from ten years and three duty stations back. She is on a traveling streak and wanted to reconnect with our family while also exploring parts of the country she’s never been. Of course I was excited to see her, but I warned her upfront that we would be in a perpetual state of motion and I was worried she would grow weary of our chaos. She came the day before Easter and left the following Wednesday. I managed to squeeze in a couple unscheduled hours to show her our Roanoke, and enjoy a glass of wine or two at night on the back porch, but mostly we chatted while I worked on keeping everyone in forward motion, or she went off and explored on her own. Finally, have you ever tried to describe something and the words just keep eluding you? This happens to me all the time. It’s another reason I end up blogging in fits and starts. I want so badly to share a thought or story, but what I am imagining never comes out so well in the end. My second son said as much the other day. Well…yes, I’ve thought of that before. But, then again, I think the safest thing is to not have that ability. Marriages everywhere are saved because of this very limitation. Anyway. This problem of writing precisely came up the other morning in my journaling. I have been reading David’s psalms and in doing so, writing my own psalms—of sorts. But all my psalms sound like David’s psalms. And this irritated me because I want my praises to be my own, not David’s (you would think that divine inspiration would be enough). But more than irritation, I found myself jealous of David, and in awe at his position. Not that his words made the canon of Scripture. No, I couldn’t care less about my words being immortalized any more than David imagined his praises being chanted thousands of years later by off-key pastors and priests. It’s the idea that his praises were the originals. Or were they? Doesn’t it stand to reason that David was just as influenced by the oral traditions and written laws—those writings and praises of precision that had been passed down faithfully from the beginning of time—as I am influenced by David today? Maybe all David brought new to the scroll was his personal relationship with the One to whom he offered his praise. Thank you – your post made me smile. Our youngest daughter is currently on a spree of writing real letters to her grandma. It is costing us a fortune in stamps. And I know, well, the difficulty of coming up with words of praise and worship that are new or sound fresh, rather than just rearrangements of phrases learnt from other songs. It is hard. I’m glad to hear I’m not the only one who struggles with the right words. Thank you, always, for reading, liking, and commenting! I too wrote letters to my Granny when I was a girl….and before she passed, my mom discovered that she had saved ever one. They are an endearing reminder of the relationship we shared for 38 years.